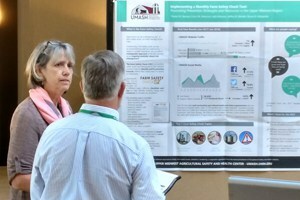 The International Society for Agricultural Safety and Health (ISASH) held their 2018 annual meeting in Halifax, Nova Scotia June 24 – 28. Diane Kampa and Carol Peterson attended the meeting on behalf of UMASH. The conference inspired and motivated us to look at innovative outreach efforts in the Upper Midwest. ISASH brings together agriculture safety and health professionals and offers workshops and staff development opportunities to focus on the key issues facing farmers and ranchers. The conference is also an excellent opportunity to share information. Diane and Carol shared posters on the Farm Safety Check and the Farm Safety Champion which discussed findings related to our 2017 farm show survey and FFA survey. We also staffed a UMASH exhibit which further showcased our products and outreach efforts. All topics have relevance to the Upper Midwest and encouraged us to look at methods of incorporating these themes into our research and outreach efforts. We came away inspired to move ahead with programs to further reach the agricultural community in our region. The largest annual gathering of professionals dedicated to farm safety took place in late June when the International Society for Agricultural Safety and Health (ISASH) met in Halifax, Nova Scotia.